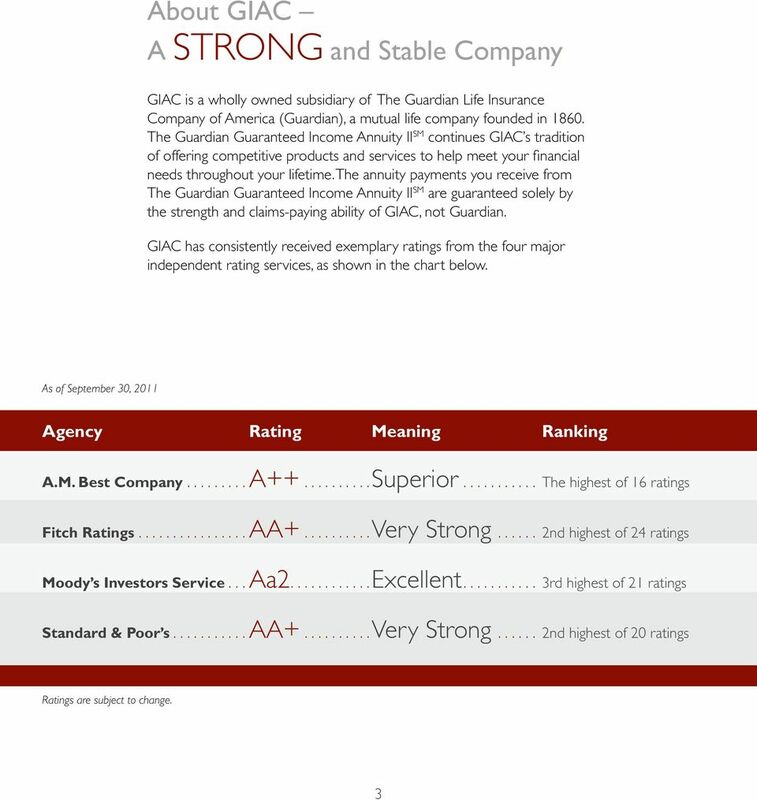 Download "The Guardian Guaranteed Income Annuity II SM"
2 What Do You VALUE Most? Please take a moment to think about your answer. People in your life may come to mind, like your spouse, children, or grandchildren. 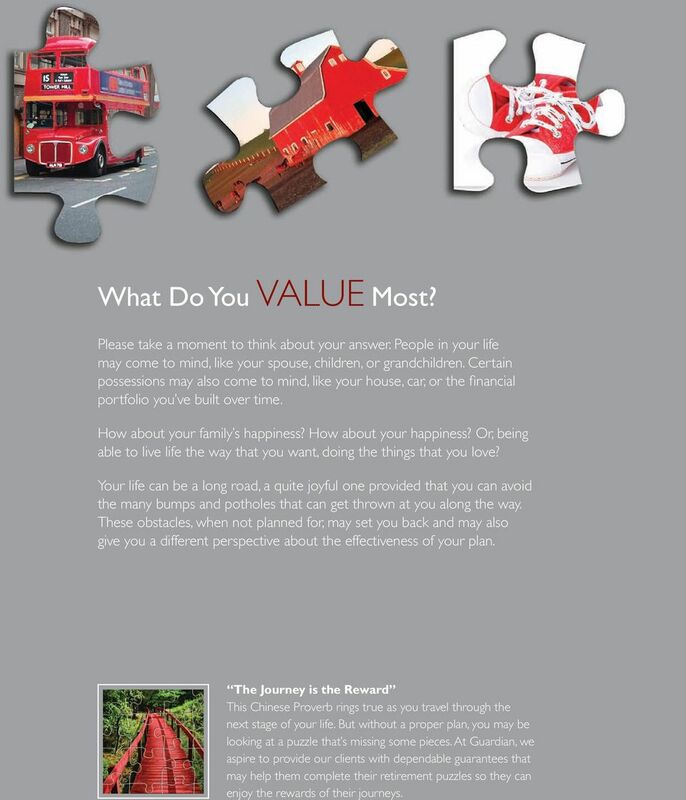 Certain possessions may also come to mind, like your house, car, or the financial portfolio you ve built over time. How about your family s happiness? How about your happiness? Or, being able to live life the way that you want, doing the things that you love? Your life can be a long road, a quite joyful one provided that you can avoid the many bumps and potholes that can get thrown at you along the way. 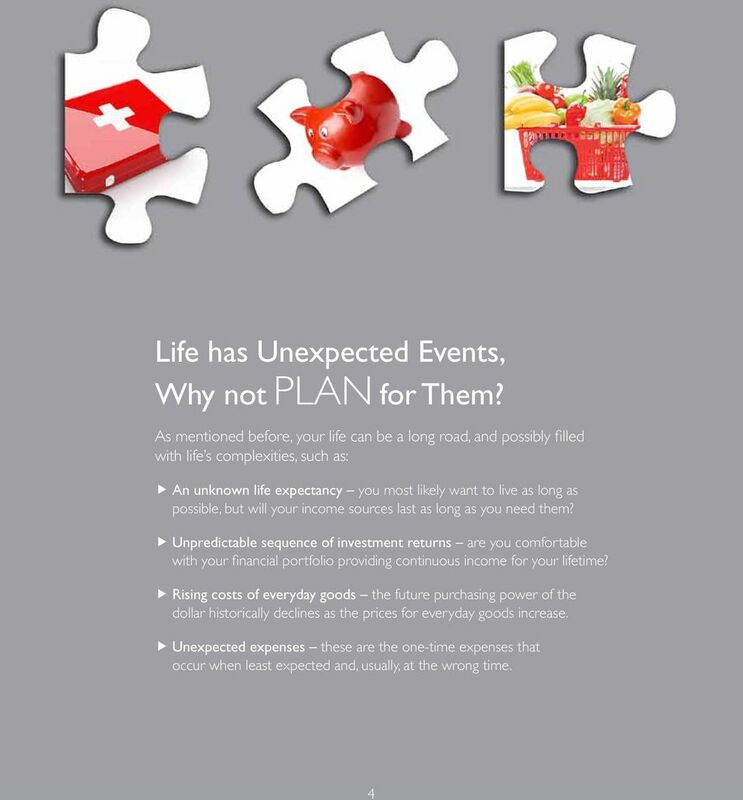 These obstacles, when not planned for, may set you back and may also give you a different perspective about the effectiveness of your plan. The Journey is the Reward This Chinese Proverb rings true as you travel through the next stage of your life. 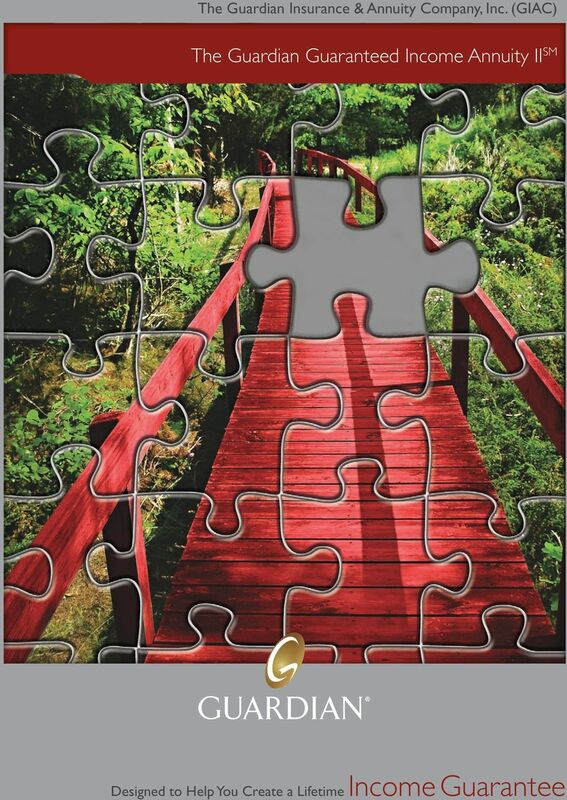 But without a proper plan, you may be looking at a puzzle that s missing some pieces. 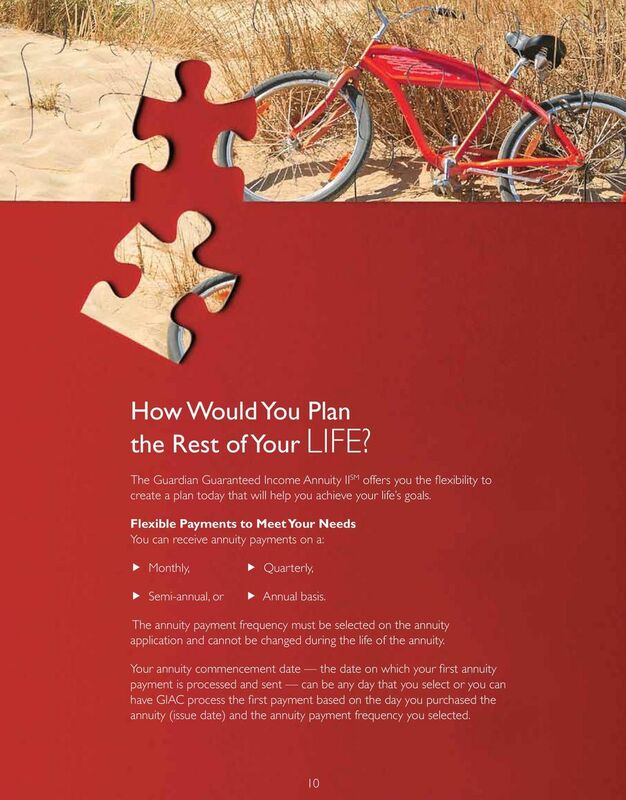 At Guardian, we aspire to provide our clients with dependable guarantees that may help them complete their retirement puzzles so they can enjoy the rewards of their journeys. 18 Give Your Life s Plan a Lifetime GUARANTEE No one knows how long he or she will be traveling down life s road, but the most prudent thing is to plan for a long trip with potential financial bumps and the occasional pothole. 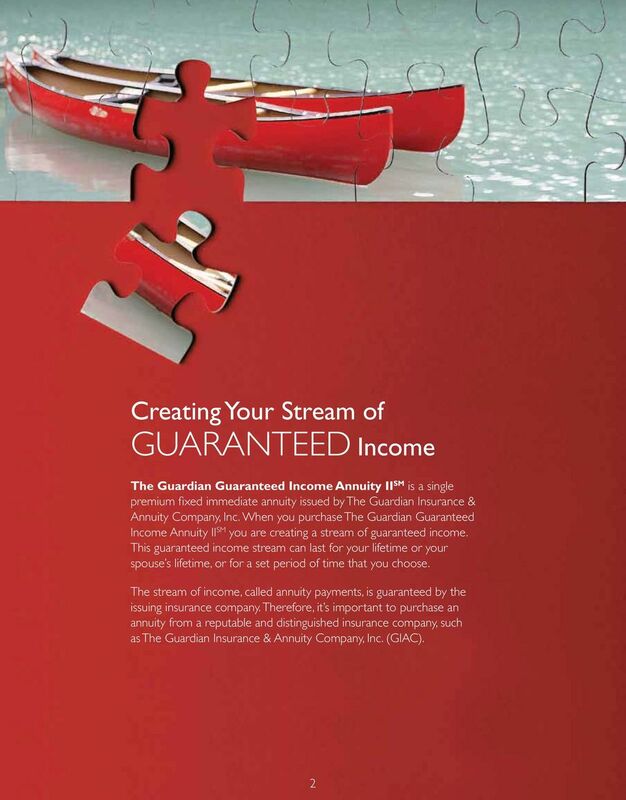 The Guardian Guaranteed Income Annuity II SM may be the right product for you because it can help you navigate through those financial bumps with a guaranteed stream of annuity payments that you can rely on. The history lesson that one should take from the past decade is that what goes up may come down, especially when it comes to the financial markets. 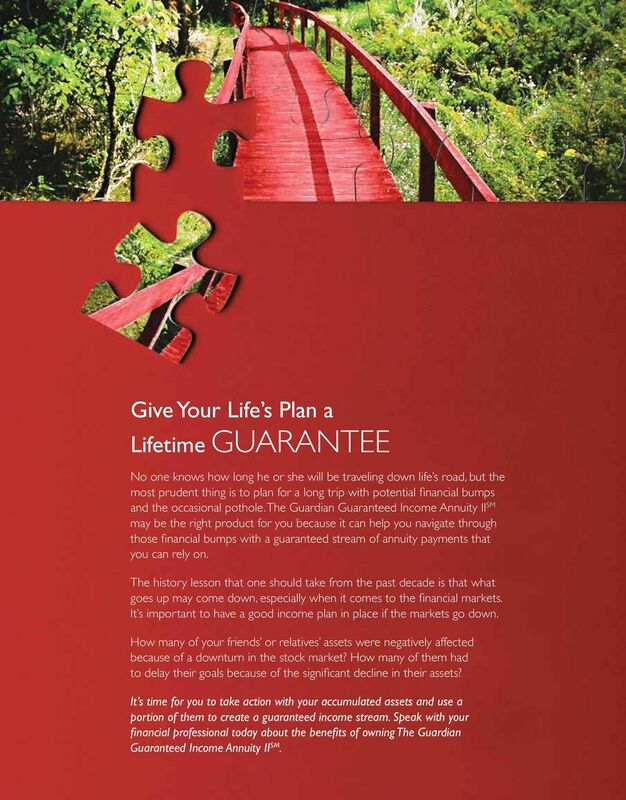 It s important to have a good income plan in place if the markets go down. How many of your friends or relatives assets were negatively affected because of a downturn in the stock market? How many of them had to delay their goals because of the significant decline in their assets? 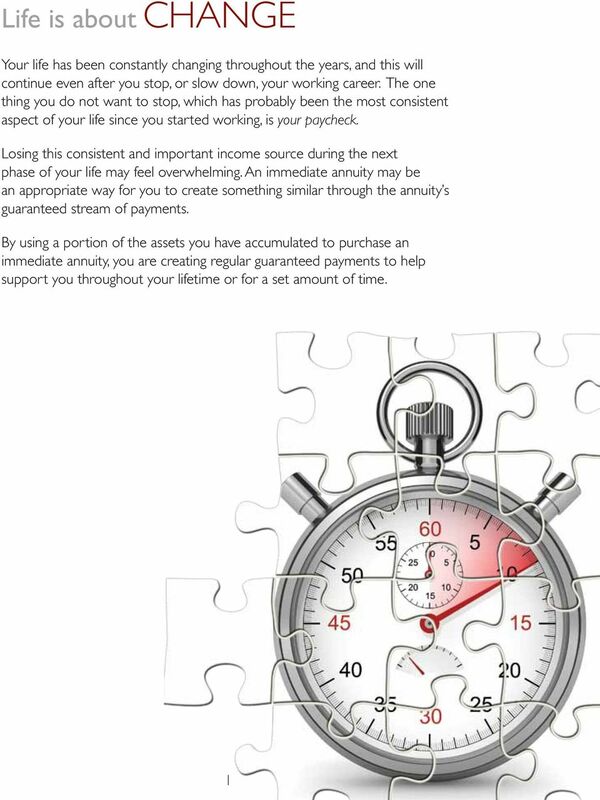 It s time for you to take action with your accumulated assets and use a portion of them to create a guaranteed income stream. 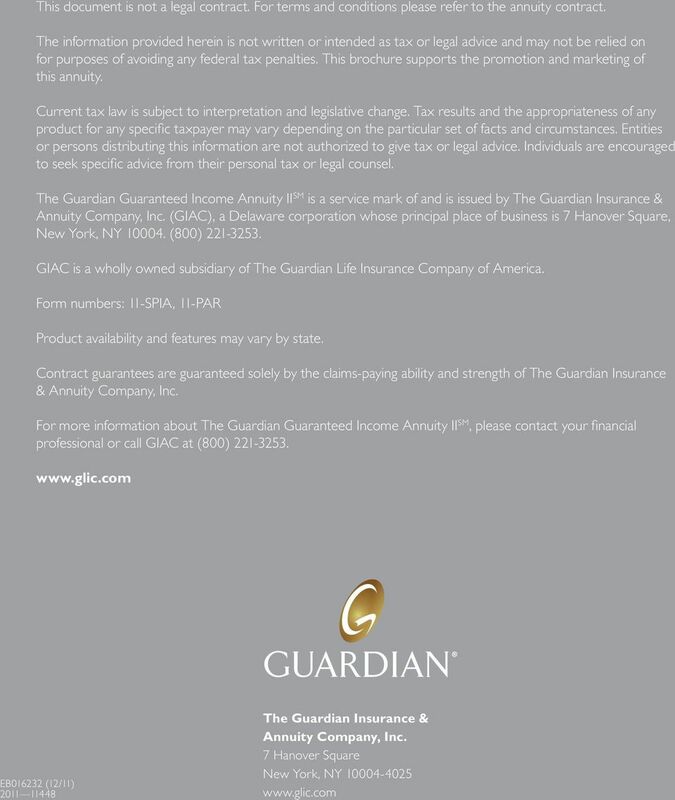 Speak with your financial professional today about the benefits of owning The Guardian Guaranteed Income Annuity II SM. 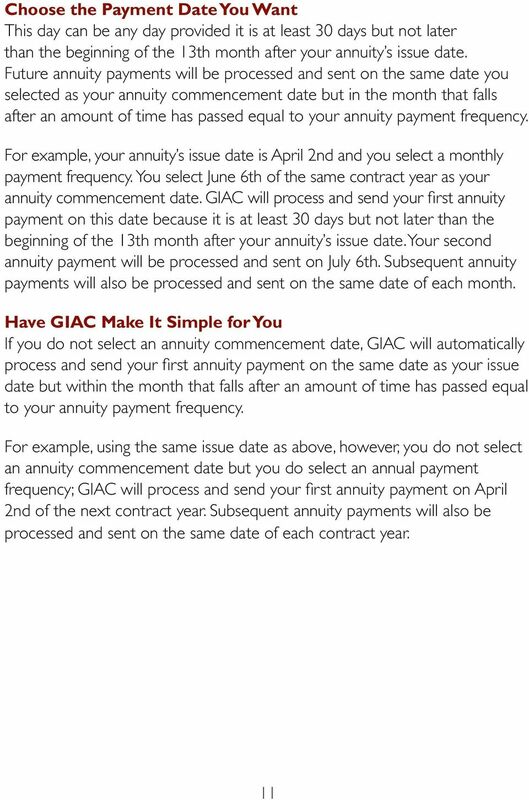 19 Tax Considerations for Purchasing an Immediate ANNUITY If your immediate annuity is purchased with after-tax dollars (a non-qualified annuity), each annuity payment made to you will consist of both a taxable income portion and a return of premium portion. 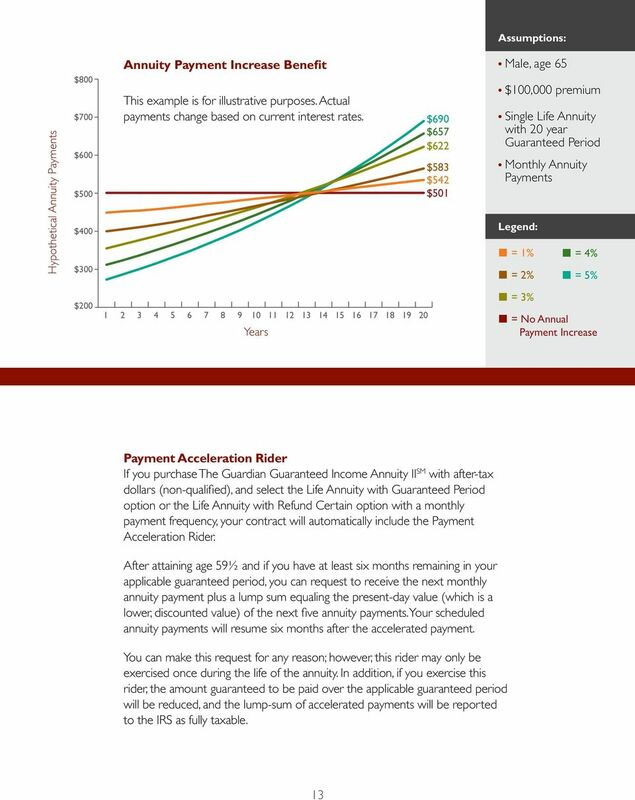 You will need to pay ordinary income taxes on the taxable income portion. 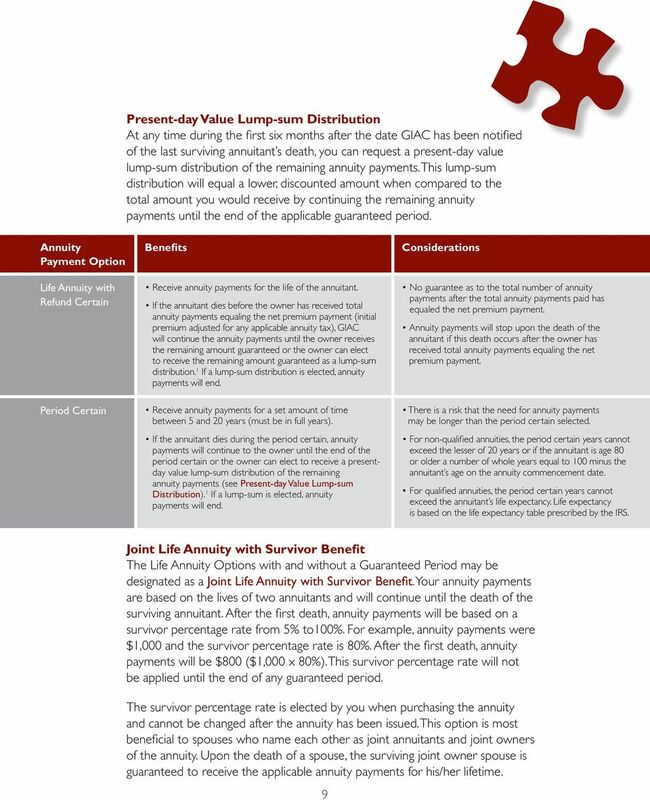 The return of premium portion is not taxable as ordinary income, but depending on your state, your single premium payment may be subject to an annuity tax which GIAC will deduct from your single premium payment when you purchase your annuity. 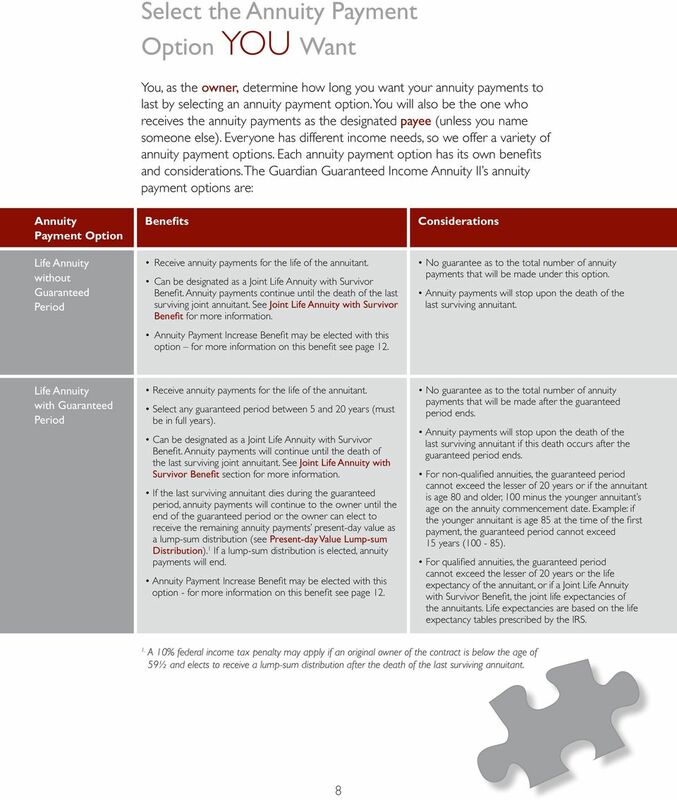 The split between the taxable income portion and non-taxable return of premium portion of your annuity payment is determined in accordance with Internal Revenue Service (IRS) rules. 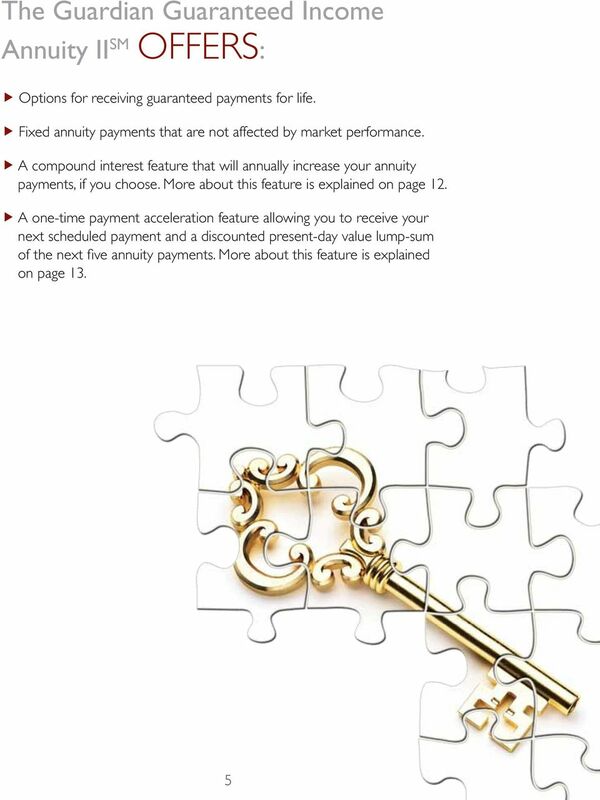 When the return of premium portion has been reduced to zero, the amount of your annuity payments will remain the same but will be 100% taxable at ordinary income rates. 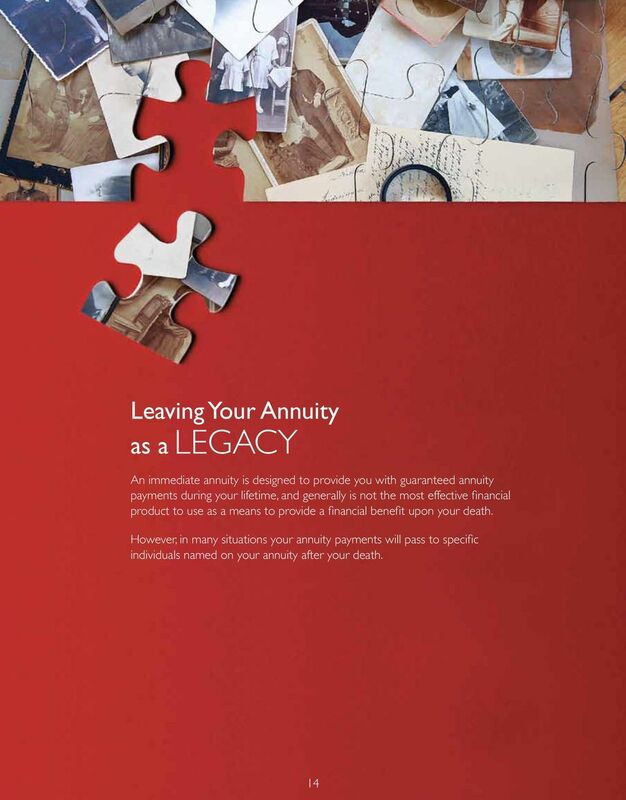 Generally, annuity payments from an immediate annuity are not subject to the 10% federal income tax penalty on early withdrawals or distributions received before you have attained age 59½. 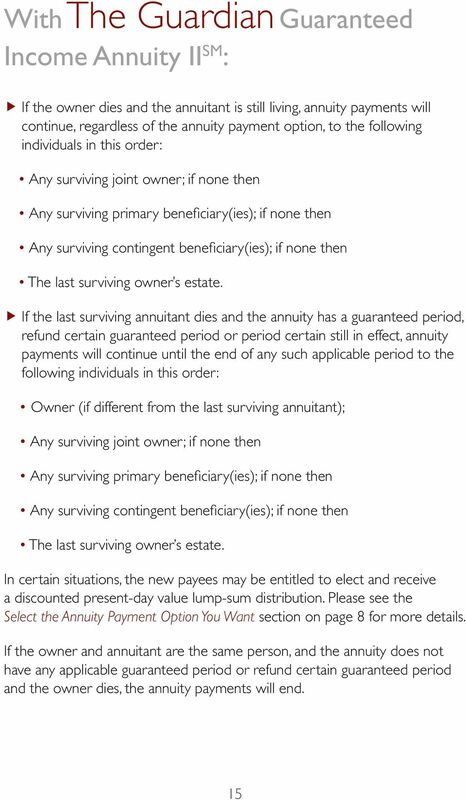 However, you may be subject to this penalty if you as an original owner of the contract have not attained the age of 59½ and, after the death of the last surviving annuitant, elect to receive a lumpsum distribution. 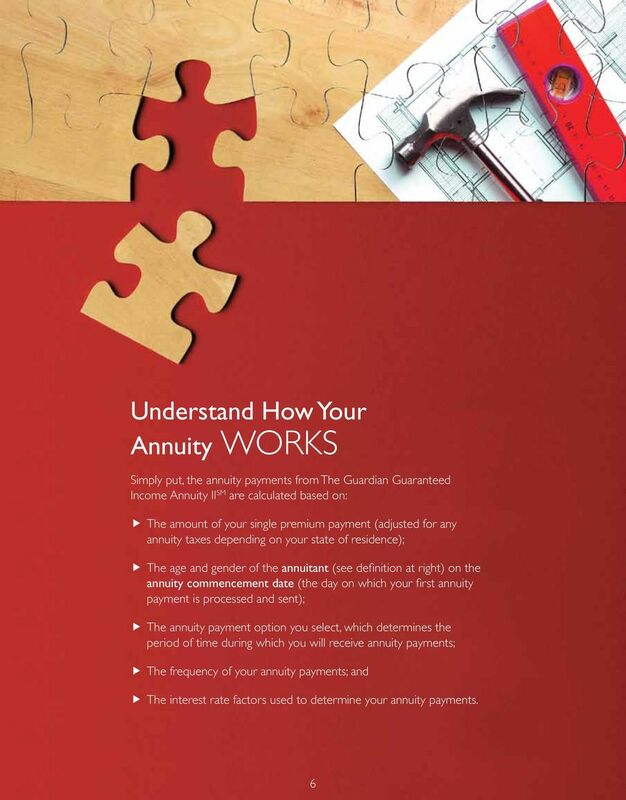 If you purchased a qualified annuity using money from a traditional IRA or a qualified retirement plan, generally the entire amount of the annuity payment is subject to ordinary income tax when it is paid to you. 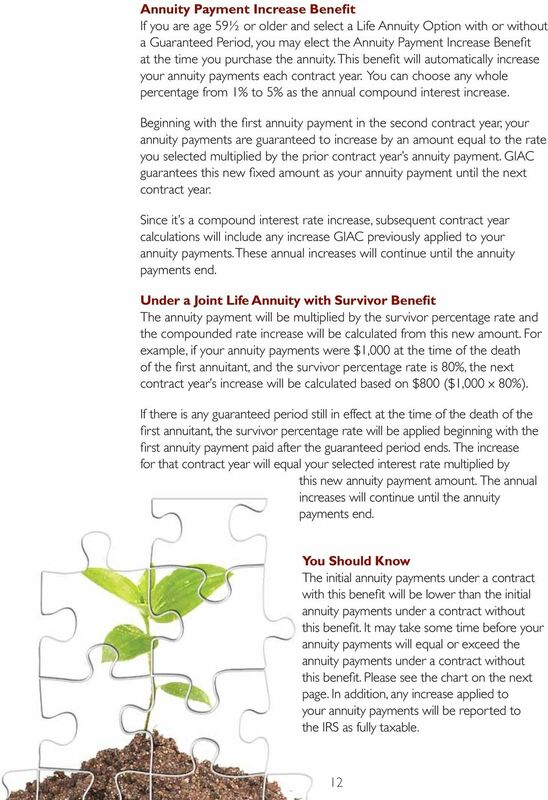 Internal Revenue Service rules prohibit annuity payments from being rolled over into your traditional IRA or other eligible qualified retirement plan. 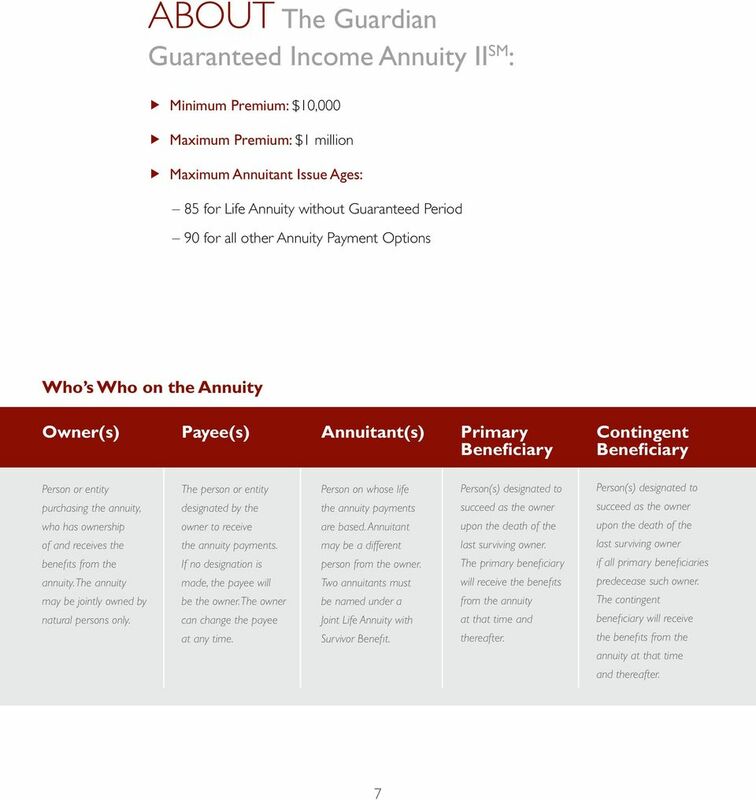 If you are using monies from your Roth IRA to purchase the annuity and wish to have your annuity payments considered tax-free qualified distributions under the Internal Revenue Code, you must have held a Roth IRA for at least five years and have attained the age of 59½ at the time of the first annuity payment. Please consult with your tax advisors for further information that is specific to your circumstances.